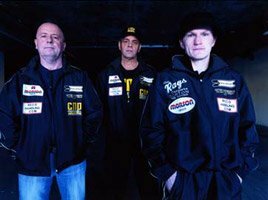 Kerry Kayes Interview: Training Boxing Welterweight Ricky Hatton! Kerry’s insights into Ricky's ability to perform at the highest level will bring you closer to the legendary welterweight … Here’s a detailed look as Kerry describes the training and diet of top boxer Ricky Hatton! Exactly what does it take to be among the world's best professional boxers? A devoted boxing fan, this is question I often pondered as I considered, with equal doses of awe and admiration, the great skills and heart demonstrated by elite pugilists the world over. 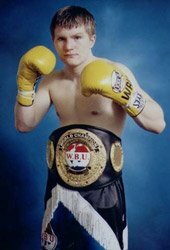 One man who has risen to the top of elite boxing is welterweight Ricky "The Hitman" Hatton, who, until recently, was undefeated in 43 fights and is considered by many the best United Kingdom pound-for-pound fighter ever. To dominate as a professional boxer a fighter requires excellence in all areas. Failure to place all of the pieces of their training/nutrition/mental approach into the correct alignment will invariably result in substandard performances, and given the competitive arena that is pro boxing is so tough to prevail in, and even tougher to stay at the top - with many challengers ready to dethrone the champion - skills alone will not cut it. 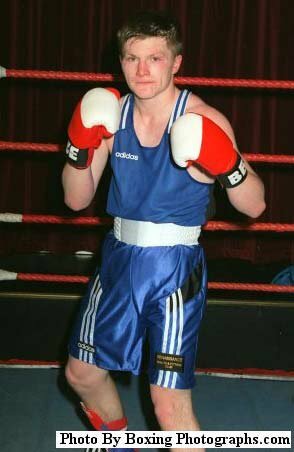 Ricky Hatton is one fighter who has made the most of the tremendous skills of which he was blessed. Since 1997 - the year of his professional debut - through to 2007, Ricky has stayed on top of his game and taken on all comers. Along the way he has beaten greats such as Kostya Tszyu and knocked out 31 others to assist his 43-fight winning-streak. In December of 2007 his record was broken after he was knocked out in the 10th Round by Floyd Mayweather Junior, in a fight that was, in many respects, controversial. Back to my initial question: what exactly does it take to become a top professional boxer, one like Ricky Hatton? In the following interview with top trainer Kerry Kayes, Ricky's complete nutrition and training (weights regimen) programs are discussed as is a look into his mindset in and out of the ring and the finer points that make him one of pro boxing's best. Since Ricky is a boxer known for his meticulous approach to his craft and ability to put it all together when it counts, he has enlisted the best to help him achieve his training objectives. 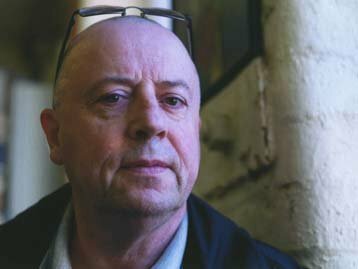 Kerry Kayes is known to be a trainer without peer and his insights into Ricky's ability to perform at the highest level will bring you closer to the legendary welterweight than you are ever likely to get, short of attending his training camps and talking with his entire training team. Enjoy this exclusive look into the life of Ricky Hatton, conducted less than a month out from his next pro fight. Ricky Hatton Training With Kerry Kayes. 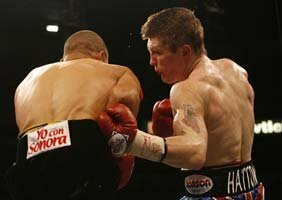 [ Q ] When and how did you become trainer for boxing great, Ricky Hatton? coach and I think he held a couple of world records for strength feats. Joe used to help Billy Graham when he was a professional boxer and used to tell Billy that whether you liked or disliked bodybuilding, bodybuilders were experts at gaining and losing weight. Billy Graham has always said to me, fights are won and lost on the scales. Joe used to advise Billy on different methods than what a normal boxing trainer would and in fact Billy Graham used to get a bit of stick from boxing trainers as he did things that traditional boxing trainers didn't do at the time. 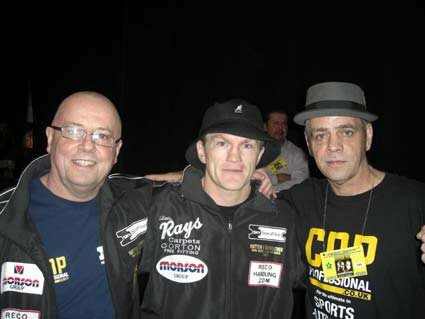 Kerry Kayes, Billy Graham & Ricky Hatton. The methods that Joe taught Billy were from bodybuilding training and he proved to Billy that they were an advantage to boxing. Unfortunately Joe is dead now; God rest his soul. He was run over by a car. 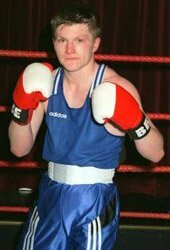 Billy knew of me through Joe and about 10 years ago we started talking, he told me about this young boxer he called Ricky Hatton. Billy knew he was going places and wanted me to work with his boxers. 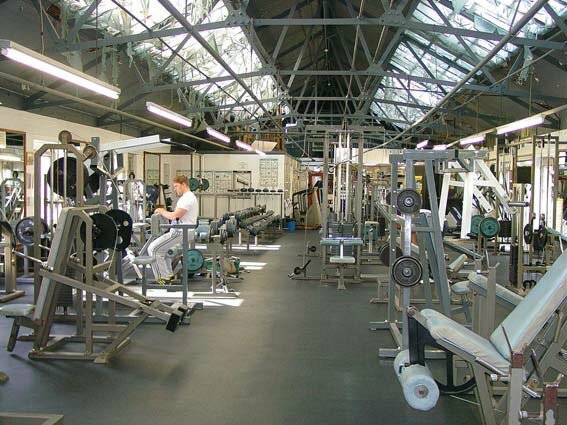 So, about six or seven years ago Billy moved his gymnasium, the Phoenix Camp into my gymnasium (Betta Bodies) which I have owned for about 25 years. Then I started working with Ricky on a daily basis. At first I had to tread carefully to gain all the boxers' trust especially as Ricky was a World Champion at the time so it was very awkward for me to say, "Start doing it this way, the way you have been doing it in the past is wrong and from now on you are doing it my way." So I introduced a little at a time; maybe changed his preparation by 20 percent for the first fight. The second fight I changed it by another 20 percent, third fight another 20 and by the fourth and fifth fight 100%. Every time I changed something, Ricky could see the benefits so when I asked him to change something, Ricky did it. [ Q ] Can you describe what kind of athlete Ricky is? What are his best qualities from your perspective as a trainer? 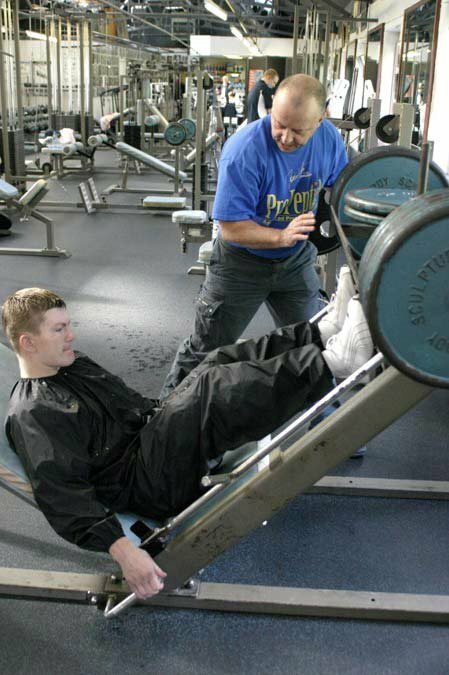 Ricky Hatton is well known for going out of shape between fights. In fact he loses about 40 pounds for every fight. One year he had four fights so he lost in the region of 150 lbs (that year), which is more than his total bodyweight. Talk about slimmest of the year! But in fairness the day he does walk in the gymnasium he is like a Buddhist monk and he really does train hard and he does everything you ask of him 100%. Ricky Training With Kerry Kayes. [ Q ] What, other than his obvious natural ability, and the ones you have already outlined, makes Ricky such a phenomenal athlete? I think a lot of the previous answer covers this but he has been naturally gifted at birth and as Wayne Demilia once said to me, "Athletes are born but then made." Obviously he worked with Billy Graham from day one, which has helped. Billy brought out the best in him and showed him the techniques that suited his abilities. He's got incredible heart, incredible lungs and seems to go forever. I have seen him come back to the corner after a very hard fight, and after 12 rounds he's not even breathing heavily. Because of his incredible heart and lungs, he can use his God given talents. Kerry was chosen as the Bodybuilding.com Personal Trainer of the Month because of his hard work and dedication to improve the sport and those involved! [ Q ] Did you make any changes to Ricky's training program following his last fight? If so, what were they? now for probably 20 fights and if it's not broken, don't fix it. We know exactly what we do. I probably work Ricky more in the first six weeks of the 12-week regimen than Billy does. It's about weight management and getting him back on the weights. We have worked out a regimen that works best for Ricky and we stick to it. [ Q ] Was there a particular aspect of Ricky's game that did not go exactly to plan in his fight against Mayweather? What was this, and what steps have his trainers taken to correct this?
. Ricky's a great boxer but his game is pressure and the plan was for Ricky to apply pressure and take Mayweather out of his comfort zone, so Billy's game plan was for Ricky to move his head on the way in, get inside and do what he did with Castillo. If you remember what Ricky did was lean his head against his opponents chest and then start working the angles, but every time Ricky got inside against Mayweather, Joe Cortez the referee broke them up, well before they were clinching. I think it is well documented that Joe Cortez had a bad night. The amount of concentration involved in boxing is unbelievable and Cortez messed up Ricky's concentration and his rhythm. Ricky got frustrated, he then got a point deducted for a blow to the back of Mayweather's head that did not land, yet Mayweather did a similar blow to the back of Ricky's head in round two and he didn't even get a warning. I think the referee played a massive part in the outcome of the fight. But having said that, it wasn't the referee who knocked Ricky out; it was Mayweather who knocked Ricky out. Mayweather was a great athlete and he won, he did a few dirty tricks, which we applaud him for, not condemn him, because if we could have gotten away with them, we would have done the same. [ Q ] Will there be a re-match with Mayweather? Apparently Mayweather is a bit upset that he is not getting the glory that he expected because a lot of people including Americans are talking about what a bad night Joe Cortez had, and apparently Mayweather thinks this has taken a bit of glory away from him so it's not for me to say. The moneymen will say but I would not be surprised if there was a re-match. [ Q ] How is Ricky currently performing in training? Any examples of improvements he might have shown compared to previous training camps? No, not really: it's not broken, so we don't fix it. We are going about our business as normal, we are trying to put the defeat behind us. The important thing is getting Ricky mentally read. He's definitely physically ready. [ Q ] Can you give me a detailed description of Ricky's current training program?
. His weightlifting regimen is very similar to a 4-day bodybuilding split, and what you have got to understand is that my job is to help Ricky's boxing by improving his strength. Weightlifting is a discipline to help his boxing. He goes into the boxing gym first, then he comes out to me, so he has not got a lot of energy left because he may have done 12 rounds in the boxing gym. I have to be very careful how I train him. Plus it's not like training any other athlete. are all exercises that you would normally relate to strength movements but have removed from his training. I cannot risk getting Ricky Hatton injured; I feel sometimes one hand is tied behind my back. I do a lot more machines than free weights and we do movements that make them sports-specific to boxing. These workouts take no more than 15 minutes because that is all the energy he has left in the tank after boxing training. 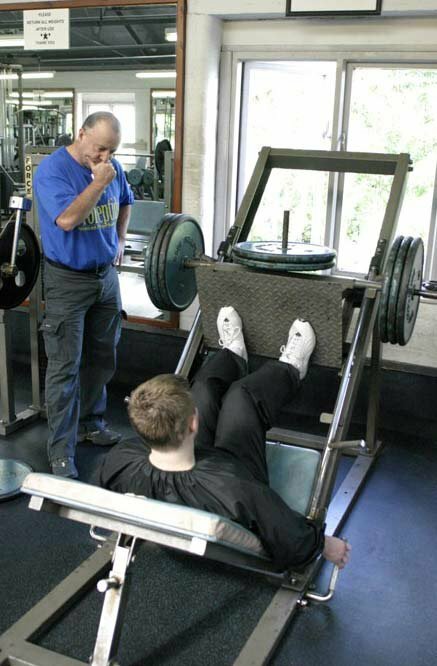 He lifts weights to failure and we never go less than eight reps to limit the risk of injury. And I'm not trying to make him a bodybuilder - I am trying to improve his strength for boxing. Don't forget, Ricky is a physical fighter, lots of pushing and shoving, so the extra strength helps. In fact, in one magazine article Ricky said the extra strength he felt that he had gained from training weights with me was the difference in winning against Kostya Tsyzu, in the latter rounds. 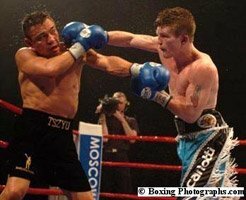 Ricky Hatton Vs. Kostya Tsyzu. [ Q ] Can you describe Ricky's exact nutrition and supplementation programs? Obviously owning CNP Professional, I use CNP products. The beauty of using supplements with Ricky and Matthew Hatton is that I can control their caloric intake. [ Q ] What details can you give me about Ricky's next fight? Ricky is fighting Juan "the Hispanic causing panic" Lazcano (what a great name!). Lazcano has a good record and we have been told he is training harder for this fight than he ever has before. Paul Malignaggi is on the bill as the chief support so if they both get through I can see a big fight between them at Madison Square Garden later on in the year. [ Q ] Does Ricky approach each fight the same way or are changes made, based on the outcome of his last fight? No, same as before: if it aint broken don't fix it. We are pretty confident that the way we do it is the right way. [ Q ] As a trainer, what would you consider to be the most important variables, from your end, associated with getting Ricky into his best shape? trainer) to work on his boxing skills. My job is to support Billy Graham. My Job Is To Get Ricky Strong. coaches only consider their part and do too much with the athlete. When they do that the athlete is too drained to train properly in his original sport. Remember, weightlifting is done to support his boxing, not take over. Kerry Kayes, Ricky Hatton & Billy Graham. [ Q ] You mentioned earlier that Ricky has a tendency to pack on the pounds between fights. What is the desired way for Ricky to 'make weight' before each fight? Is this ever much of an issue for him? environment and you can see that it works. [ Q ] Based on what you know, what motivates Ricky to reach his boxing goals? any athlete? Look at bodybuilders: the human mind is incredible. In boxing it is different; there is money involved, but when you get to Ricky's level you can't say they need the money. That would be like saying Oscar De La Hoya fought this weekend for the money. But we all know he doesn't need the money, so if it's not the money, it's got to be the challenge and pride. It's Got To Be The Challenge & Pride. I think Ricky gets so fed up with being out of shape between fights that when he comes into the gym he really wants to get back in shape. I think it's like a mini contest diet for each fight. It's not a show, it's a fight but that's how he works it. [ Q ] Can you give me an idea of Ricky's personality inside the ring versus his personality outside the ring? Outside the ring Ricky is a comedian. You've only got to look at the documentary 24/7. If anyone ever sees him on TV they will see him laugh and joke with everyone, he's always got time for people. As soon as that first bell rings, though, he becomes a fighter; he takes it really seriously and wants to hurt his opponent. As soon as the last bell rings for the end of the fight, he's a nice guy again and he wishes his opponent all the best. Ricky Takes His Fighting Seriously. with lots of opponents after the fights. Because of his personality and people's ability to relate to him, he sells more tickets than any boxer on the planet. Everybody feels they know him. 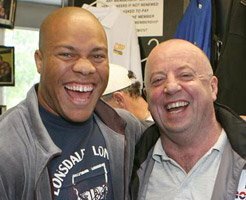 [ Q ] I understand top professional bodybuilder Phil Heath recently visited Ricky and yourself. Were you able to convince him to spar, or at the very least, hit the heavy bag? No I wasn't (able to convince him). didn't actually train, he had been to FIBO and he was doing something in Finland the following weekend so he took the opportunity to call into Manchester. A year ago I invited Phil to guest pose at my Northwest qualifier for the British Championships and I think he enjoyed Manchester and my company, and I definitely enjoyed his. I organized for him to come back to England for Paul Smith's show in Portsmouth and I have asked him to come back to do my North West Qualifier in 2009. Phil Heath And Kerry Kayes. Phil is easy to get on with; I've had a lot of top bodybuilders over to Manchester and I'm not the type of promoter to bother them when they go home. I don't telephone or email them every week and I think they respect that. If every promoter tried to keep in constant touch they would just be overwhelmed. Ricky definitely enjoyed Phil's company and Phil enjoyed Ricky's. Unfortunately Ricky was in training so he couldn't have a night out with Phil and I. Ricky has said, "Try and get him to come back when I'm not training and we'll have a night out." [ Q ] Is Ricky a fan of bodybuilding as well as boxing? Definitely, he thinks bodybuilders are unbelievable. When Ricky goes into training for 12 weeks he describes it as going into the monastery, and anything more than 12 weeks, he would crack up. He cannot believe that bodybuilders do it 52 weeks of the year. He really respects bodybuilding and he respects it even more since I've been involved with him because I've been able to bring bodybuilding principles to Ricky Hatton's game and it's proven to Ricky how much we, as bodybuilders, know about the human body. [ Q ] In your opinion would having the kind of muscularity that Phil Heath possesses slow a boxer down? Hypothetically speaking, if someone as large as Phil fought someone with similar boxing skills, but with 30 percent less muscle, what would the likely outcome be? Depends on how long the fight would last. Stronger muscle will explode faster; we all know that. But as the oxygen debt became greater, the bigger man will slow down. If two equal athletes fought, the bigger man should win early, but if he didn't the lighter man would start to take over. [ Q ] As you have mentioned throughout this interview, boxing and bodybuilding are definitely compatible. In a nutshell, why is this? to enhance him physically, which helps his boxing. 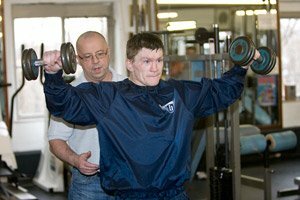 [ Q ] What are your personal goals as Ricky Hatton's trainer? coach, I want him to be the strongest he can possibly be whilst staying a light (junior) welterweight and it would be great to see him get a rematch with Mayweather; show the fans that Ricky was good enough to compete with him. Strongest He Can Possible Be. [ Q ] Where do you ultimately see Ricky's career heading? I don't see that Ricky has got more than three or four more fights left in him and I think that Ricky will go into media. Everybody in media who meets him, likes him, and he's just got this natural gift on TV so I think he will go into the media (arena). Ricky Hatton & Kerry Kayes. Hatton did well when he boxed and controlled the range, utilizing his jab and dominating a lot of the early exchanges. 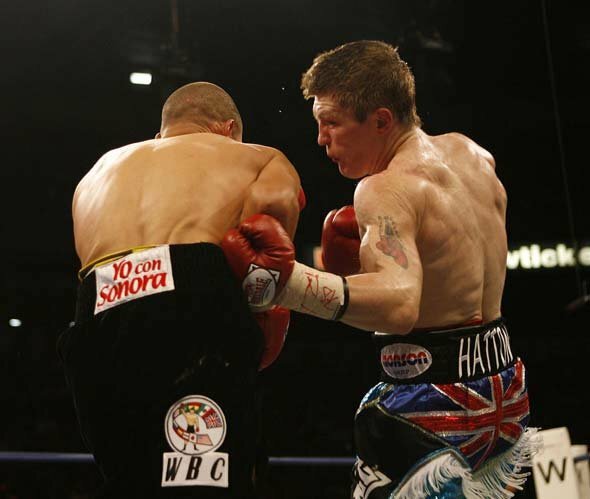 In round eight, Hatton absorbed a left hook to the chin that wobbled him, and in round ten, Hatton was hurt again by a left hook. Despite that, Hatton outworked Lazcano to win a good majority of the rounds. Ricky Hatton beat Juan Lazcano by unanimous decision in round 12 of 12.